The Ambassador of Spain in India, Gustavo de Aristegui in an interaction with Mr. Jayant Baranwal, Editor-in-Chief of SP’s MAI explains how Spain has in the last about four years deepened ties with India and looks forward to strengthening the relationship based on trust and benefits. He specifically highlights the role of the Indian Air Force during the recent crisis following the earthquake in Nepal where the IAF personnel showed exemplary dedication, commitment, camaraderie and humaneness. Jayant Baranwal (Baranwal): Could you tell us about your experience with the Indian Air Force during the crisis in Nepal after the earthquake? 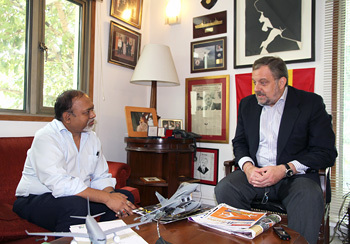 Gustavo de Aristegui (Ambassador): Yes, I have to tell you the story about the Indian Air Force which is beautifuI. I spoke to the Indian Air Force Chief several times for several reasons to help us with the VVIP government jet that was flying in with our foreign minister so that we could fly that jet and take our nationals out. We took back with the minister something like 50 people. We took out of Nepal in a different jet about 85 people. I was at the airport everyday and I saw the operations of Indian Air Force with my own eyes and I saw the professionalism, dedication of the men and women in uniform serving in those days. I was in absolute admiration of them of what I saw. I have a beautiful picture over there at the airport of Kathmandu with Air Vice Marshal Ukarjit Singh speaking with me. He was one of our interlocutors in the Nepal crisis almost every day. He is a fine gentlemen and a fine officer... really one of those great guys that you meet, and a real leader and you could see the respect of the pilots and staff. They flew rescue missions to look for Spaniards and other nationalities. We gave them the GPS codes and since they were mountaineers it was difficult finding them, but they helped us with our rescue team. You can see our military emergency unit in orange uniforms in the background that were flown up to Lantang valley and flown out of Lantang valley. It was a real experience to have had the opportunity of sharing chai (tea) with my good friends of the Indian Air Force. There was lot of camaraderie. We gave Ukarjit Singh this flag which is the unit flag of the Spanish military emergency unit. It is called the backpack flag. It was used originally in the 16th and 17th century by Spanish soldiers. It became a common symbol of Spain’s armed forces and later went into disuse and was brought into use again in the early 20th century. We gave it to Air Vice Marshal at Kathmandu. It was very much an air operation that we ran over there those days. My support for the Spanish armed forces, in general and the projects that we are focussing on in India and because of our missions in Nepal, the Spanish government gave me the highest Air Force decoration of the country about three weeks ago. It was a beautiful and emotional thing when I saw that the cabinet decided to give me the highest air force decoration in Spain. So I was very proud to have been part of the operations as the head of it. I already had a great deal of respect for the Indian Armed forces and the IAF and I can tell you have one of the finest in the world and that your officers are true gentlemen, with feelings, with great deal of solidarity, courage, camaraderie really something that you can really feel proud of. They are exceptional. Ambassador: That is a good metaphor. I can tell you about the operation and the bigger picture as I saw it happening. The military operation of rescue and support to Nepal in the first hours after the tragedy was absolutely brilliant and I was really amazed to see all the action happening on the tarmac and the Indian C17s, il76s, helicopters, Mi16s, flying in and out of dangerous situations. Baranwal: Could you tell us about the civil aviation conference which you attended in New Delhi recently? Ambassador: The conference was surprisingly good. There were some Interesting details about the booming market that aviation is going to be in India. You see that there are less than 350 jets operating in the country which is so huge. You see crowded airports and they say less than one per cent of Indians are flying, just imagine what is going to happen when two per cent of Indians are flying or five per cent of Indians are flying or 10 per cent of Indians flying. It is going to be a crowded sky. The predictions that some of them are making that there would 1700 or 1800 jets in the next 10 – 20 years, I believe it would be more. Right now, we as part of Airbus Spain are proud that it is one of the biggest, if not the biggest market in the world. Airbus has the largest market share of any other market in the world. It is a remarkable achievement. Baranwal: What do you think of the recent record breaking order of IndiGo of 250 Airbus A320 neo aircraft making a total of 530 aircraft A320 within a limited span of time? Ambassador: I know it is difficult business and that the volatility of the markets, the volatility of the price of fuel and oil is affecting the profitability and the stability of the business. It is obvious. But in this environment it is very amazing to see such brilliant executives as most Indian airlines have. In many aspects they have created trends... for example in negotiation. Indigo is not just about buying planes at a reasonable price, negotiating well with the manufacturers of aircraft or manufacturers of engines. It is about financial engineering, it is about their management, it is about their structure cost, it is about their personal management, their human resources and it is really quite amazing. I can tell you that I have flown in all Indian carriers, absolutely all of them and I like all of them. Baranwal: What are the reasons for you to like them? Ambassador: Everyone has specificity. For example, Indigo is very efficient and very much on time and its’ personnel are warm. I like the formula of GoAir with these two front rows and an empty seat in the middle. I like it a lot. Goair is really one of my favourites. I like the new Spicejet. I have a great deal of respect for Ajay Singh, the CEO of SpiceJet. During the Nepal crisis we had over 700 Spaniards stranded in Nepal. We ended up evacuating 350 and the vast majority of them through Delhi, mostly on commercial flights. We had a concentration of about 300 Spaniards on the night of 26th April in the facilities of San Jose, a Spanish company that is refurbishing and enlarging the airport of Kathmandu. We were not getting permission to land our government jet in Kathmandu and the Indian Foreign Minister Mrs. Sushma Swaraj who was hosting the Spanish foreign minister that night gave me the contact of Ajay Singh. They were operating normally from Kathmandu and they were operating with commendable spirit of service. We were able to take out 40 Spaniards and on other Spicejet flights also several dozen Spanish nationals were evacuated and it was thanks to his generosity and his humane vision of the crisis. He was permanently on call, day and night and on whatsapp and on telephone and he always kept his word. His team was efficient and his team was good. I have to say a lot of airlines were not able to fly in and out of Kathmandu in the first 72 hours, four or five days of the tragedy, but they kept on flying, probably they were one of them flying normally. The rates were also absolutely normal and they gave free food on board. They were doing that for humanitarian reasons and I thought it was a beautiful gesture. Baranwal: Could you tell us about your views on India’s aggressive ‘Make in India’ initiative? Ambassador: We are in very much favour of ‘Make in India’ and we have told our interlocutors many times that. We have gone through similar phases in Spain. In yesteryears, we used to buy hardware from other countries, United States among others, we used to build somebody else’s designs, today we do the whole thing on our own. We want to be a partner with India in the defence industry and this why we had a visit of our Defence Minister in March and we have an upcoming visit of the Minister of State for Defence in end September. It is not only about transferring technology and building together in India, it is about developing technology together. We are very clear about this and we want this to be fulfilling partnership, based on trust, mutual respect and mutual beneficial conditions. Take the C295 which is 100 per cent Spanish. It is the L1 option of the IAF for the Avro replacement. It is best of the class and 21 air forces around the world have it and no other aircraft of this sort has that record. The MRTT is a phenomenal machine! It is 47 per cent Spanish project because all the refuelling technology especially the boom is Spanish. The design is accurate to the millimetre and it is unbeatable. It has won every tender to date. Baranwal: Is this boom also produced by CASA which is now Airbus military? Ambassador: Exactly. We are in favour of ‘Make in India’ and anxious to make in India in the aviation field. We are already there in renewable energy, sanitation or water treatment etc. Baranwal: Do you foresee any joint development with Indian authorities and Spanish authorities of programmes like A400 in future? Ambassador: I would like to see that in the future. It is very early. The A400 is the best aircraft ever built. It is a landmark, no matter what people may think happened in the civil, it was a disgraceful accident that happened and it was a software problem, but the plane is extraordinary. It is a turboprop that files as a commercial jet. It is the fastest turboprop. It is a 40 tonner plane, by the way the C295 is 9 tonner. It has extraordinary capacity and it is the biggest of the class. It has extraordinary capacity and can fly in high temperatures, it is an extraordinary plane. I am sure it is going to become a product on the wish list of the Indian Air Force because they want the best and it is only logical that they want the best. In its category it is more than two times than the C130, faster, better, more reliable and more fuel efficient. What else can you ask from the plane. It is the state-of-the art. It has a cockpit of a 380 and it cannot get better than that. Baranwal: You mentioned that you used to import for a long time, how much did it take for you to have a totally ‘Make in Spain’ industry? Ambassador: We still buy from abroad. You cannot produce everything. Nobody does, not even the United States. It took may be about 30 years to get to super top notch high tech industry. I think India will take lot less than that. Baranwal: Why do you think India may take less time to have its own aersopace and defence industry? Ambassador: Indian companies are producing components for Boeing and for Airbus already, from very sophisticated parts of the fuselage, to discs for the brake, the wheels for a plane and we are not talking of a disc of a truck or a tractor. We are talking about a disc to stop a Boeing 777 or an Airbus A330 . India has some very interesting aerospace companies that are in fields such as missile, missile guiding, laser guiding systems for missiles. You are already there on so many fronts. The period for the indigenous military defence industry in India is not a matter of time and in so many aspects it is already there. Baranwal: Could you tell us about Spain’s strength in Civil aviation? Ambassador: We are very happy with our conversations with the Ministry of Civil Aviation. We are certain that in my talks with Indian officials of the ministry of external affairs and so many other ministries I have seen that in the last three and half years, there has been a greater proximity of both countries in so many aspects and deeper ones. It is really in aspects that pertain to technology cooperation, industrial cooperation, investment cooperation and many other fields. Indian authorities have noticed that Spain is a world player in a lot of aspects that have not been taken into account before. We are the sixth largest industrial defence country in the world, just after the five permanent members of the Security Council. The sixth largest producer and exporter of defence technology is Spain, bigger than Germany, Italy, Israel, South Africa and Brazil. The two flagships of the Australian Navy are Spanish designed and built. The state of the art frigates of the Norwegian navy is Spanish design and built. The flagship of Thai navy is Spanish design and production. The C295 is in 21 air forces and that is phenomenal. Baranwal: Could you tell us about partnership between India and Spain in civil aviation? Ambassador: Civil aviation is very important thing because it is going to boost the relation of two countries. We were exploring the possibility direct flight between Madrid, Barcelona and New Delhi with Air India. It is on the table. I have a conversation pending with new Air India Chairman. On the other hand, Iberia is out of the red and in black. They are linking Madrid with each and every capital of Latin America. You name the city, Iberia goes there. The hub cooperation between India and Spain to link India to Latin America is without doubt Madrid. The shortest and most efficient way is through Madrid or Barcelona without any doubt. So we have to work on that. Baranwal: How does the hub cooperation work? Ambassador: For example some hubs in Europe that are not well connected with Latin America are seeing a growth in traffic between India and Latin America of about 30 per cent which is enormous. I am talking about cities which are not connected to Latin America. Just imagine if those flights were redirected through Madrid, what the growth would be on those flights, it would be crazy. And there are some countries where India has enormous interests such as in Mexico, Peru, Chile, Argentina and Brazil, although these places have direct flights from Madrid and other cities. Right now civil aviation cooperation is going to be a super star in our bilateral relations. Baranwal: Spanish company Indra has market leadership in civil aviation, could you talk a little bit Indra? Ambassador: Yes, it has 90 per cent market share. Indra is the biggest player in air traffic controls systems. Indra is the biggest in that sector in the world, even in Germany they have overwhelming share and in Europe it is 60 per cent in the United States it is 35 per cent. It think it is extremely interesting to have cooperation in this field. Spain has some of the most advanced systems of air traffic control, some of the most advanced civilian radars and systems. It is absolutely amazing to see Indra is the world’s leader in this field. Baranwal: Any expectation from the defence procurement policy? Ambassador: We are one of the very few countries that has approved a strict and efficient G2G legislation, this enables transparency, accountability, efficiency, expediency in defence cooperation between India and Spain and between Spain and any other country. We have also signed an important agreement on protection of classified information which is of course essential for transfer of technology. We have the basis for a solid and very efficient bilateral cooperation in defence and high technology. Baranwal: You are saying that the G2G will pave the path to increased defence supplies. 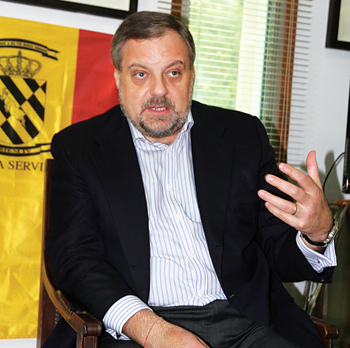 Ambassador: Spanish companies will abide by the rules of the tender and the laws of the country. It goes without saying. Spanish companies are known for that. We do not mess around any kind of wrongdoing. The Spanish government does not support that, the Spanish government does not back that. We are clear about cleanliness of the project and the absolute transparency of the process. We all know that G2G has the great advantage of not only of the expediency and the efficiency of the process but also of transparency and it guarantees that there is no wrongdoing along the line. It is an instrument that is at the disposal of our friends. Baranwal: Any expectation from the Indian civil aviation policy. Ambassador: India has enormous potential in tourism as I said in my speech yesterday. You have beautiful landscapes, every climate under the sun, breathtaking historic monuments, birth place of so many religions, you are one of those countries people to love to come, you have one of the five most well known monuments in the world the Taj Mahal. About 70 per cent of Himalayas is in Indian territory and I am saying India has to become aviation friendly. India has upgraded airports, lot of them are new, but they have already become small. The new Goa airport is already crowded. Look at Trivandrum, they could not close the old one because the new one was small. The low cost goes to the old airport while the regular carriers go to the new one. Air travel has a great future in the country and that Indians are going to be moving to II, III and IV cities, also by aircraft. In smaller airports they are going to be flying turboprops. One of my aims is to bring a Spanish company, right now there is none to connect points of tourism as attractive as Rajasthan by a circular flight. The connection can be Jaipur to Udaipur to Jodhpur to Jaisalmer, so that people who want to fly these places don’t have to come to Delhi or drive for eight hours. It will be absolutely great and it will boost tourism there and do exactly the same in other places like that in India. Baranwal: Is there any specific solution for that in Spain? Ambassador: I spoke to the Chief Minister (Rajasthan) about this because I see a lot of potential. The Canary islands of Spain which is seven islands are linked by two or three Spanish private airlines and one of them is Binter. They efficiently cover the islands with constant flights among them. It works very well. It has boosted tourism in the islands. They are operating ATRs, C295 that kind of aircraft.